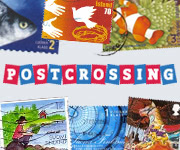 Have you heard of Postcrossing? It’s a site for exchanging post cards with members from all over the world. I think it’s a wonderful idea so I signed up for it! It’s a lot like BookCrossing too. I didn’t sign up to send or receive books though, because the cost of shipping out books to other countries tend to be more expensive than just buying new ones myself. Maybe I’ll change my mind someday, maybe not. It’s a good idea though. It would be nice to just have a local version. Anyway…. Today was family day. Baby Amir is in the house, along with his parents. We all went out to lunch to celebrate my Mom’s birthday (her actual day was on Friday). The little angel is currently asleep on the couch, surrounded by pillows and flanked his grandparents (my Mom and Dad). He is so cute. For some reason I had thoughts of our old dining table from when I was little. We had that table for maybe 16 or 17 years, maybe more. There was a time when my brother and I used it as a table tennis table. I am not making this up. Someone gave me a set – actually just a miniature. The paddles were way small or maybe they were just kiddie sized. We’d set up the net (it wasn’t even a screw-on type, you just stick it up on the surface but the suction thingy isn’t that strong so it’s prone to toppling over every time you hit the net), take our places, and hit away. I don’t remember what age I was then, or for how long we did it. I don’t even know if it was something we did just once or repeatedly. But I have a memory of it. A fun memory of spending time with my brother who surely would have been in high school by then.